I recently spent a few days climbing in the area. 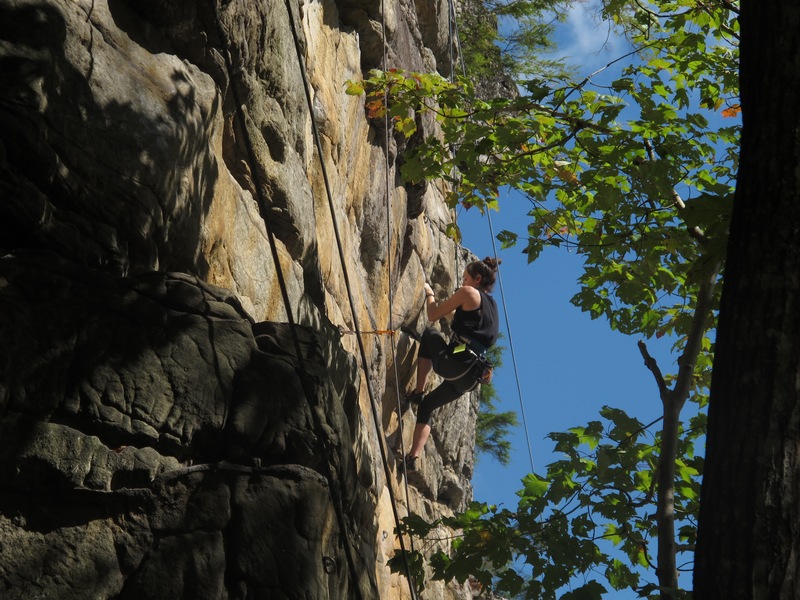 Prior to this I’d only climbed outdoors once – and it was only on a route or two in Great Falls. I didn’t really consider it a true climbing trip. For me, this was the first time to really experience the differences between plastic holds at the gym and real, unforgiving rock. Kara cranking on a hold near the reservoir area. And the real difference is not in the holds – in which it’s too easy to draw the distinction. Some jugs remind me of the round plastic pieces I throw for at the wall. Instead, the biggest difference I found was creativity. 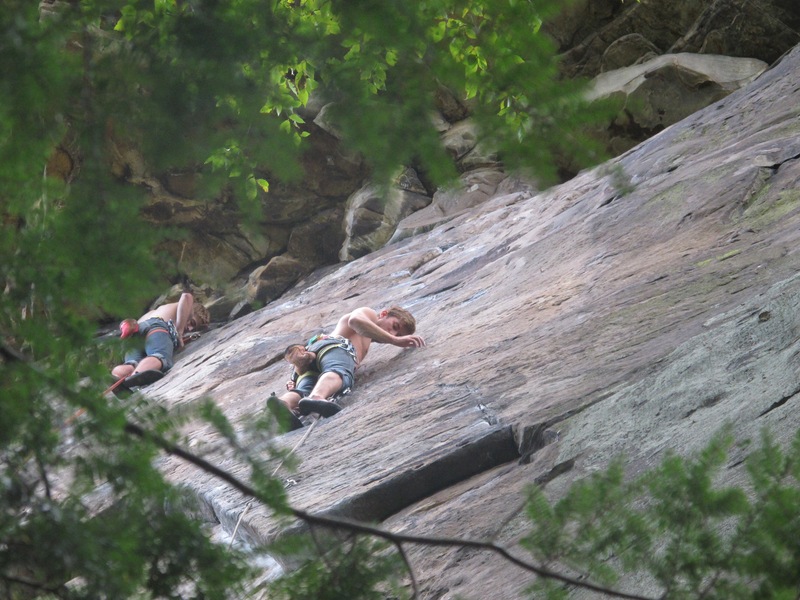 Climbing outdoor routes (long routes, at that) allows you to be very creative – both in style and technique. Because indoors, you’re likely limited to a certain beta, or a sequence of moves on a route or boulder problem. Foot placement, for example, is up to you on an outdoors route. Obviously, some routes with limited holds can only be done a certain way. You’ll often see higher graded routes with highly defined chalk marks, much like colored tape on indoor routes. But for the most part, the way you climb outside is up to you. Bobby peering down as he leads on a 5.11. Indoor climbing has been increasing in popularity lately. Gyms are growing more and more crowded. During a recent weeknight venture to NY’s Brooklyn Boulders, I noticed there were small waiting lines to hop on a route or boulder problem. But I see indoor rock climbing as practice for the real thing. Because you can’t replace the feel of cold granite with manufactured plastic. Photography is a strong part of reading about places, and I admire your use of photography. Additionally, I enjoy how you allow your topic to wander a bit; I clicked on this post expecting a read about the place, its beauty and perhaps a brief mention of what you did there. Instead, I learned a bit about one of your interests (rock climbing) and got to read a story entirely about that instead. I will continue to follow your blog with interest – keep up the good work!